It's only a few days that we returned from the city of Kastoria and as I look at the photos, I wonder why I haven't visited this city until today.. And is not that I hadn't thought about or that I didn't have a chance, but knowing only little about this city (actually these two - that is surrounded by a beautiful lake and its residents deal mostly with fur), there was always a destination that fascinated me most and I was always postponed this trip for another time .. This time came, somewhere in the middle of August to prove to me beyond any doubt, how wrong I was all those times when I rejected this city and to make me wonder, how much more I could be impressed by Kastoria if I have visited the city during the winter, with the lake be frozen and the beautiful mansions faded away behind fog? 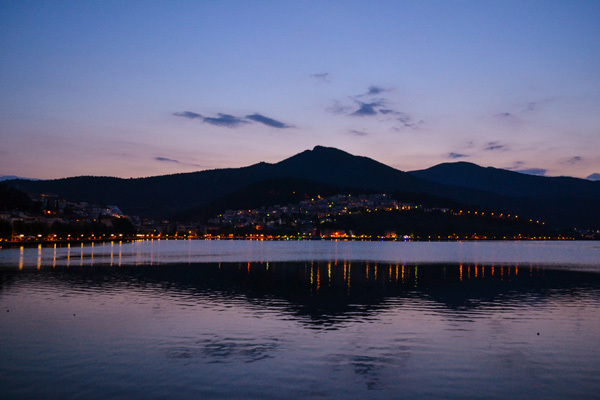 It may sounds strange to you, but for the days I was in Kastoria I had the illusion that I was on an island. The fact that the city is built on a peninsula that enters the lake has the effect of seeing the lake in front of you almost anywhere in the city. Lake Orestiada now covers an area of 30 square kilometers, much smaller than its original form, which was formed 5,000,000 years ago. 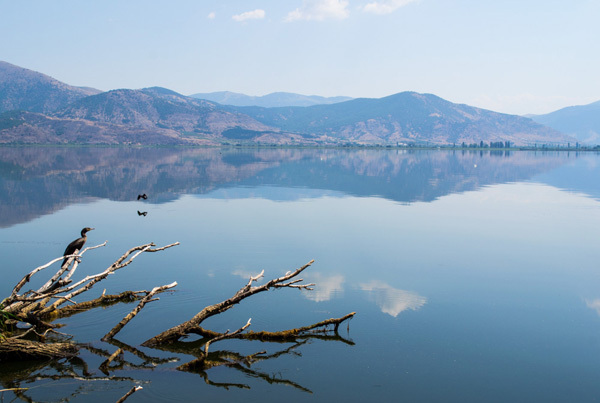 We made the lake around two times both by car and on foot (not the entire lake but the Kastoria peninsula - 6km long) and the pictures we saw were impressive. 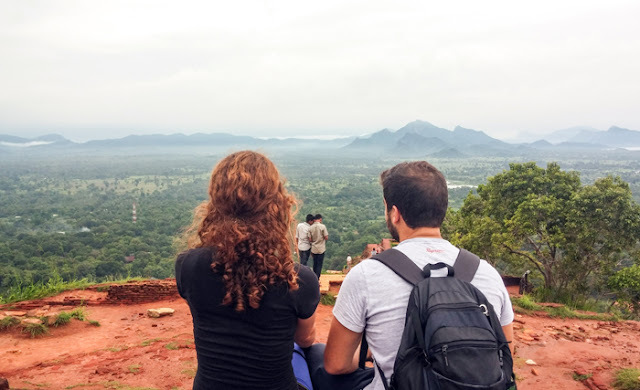 We saw swans, ducks, cormorants, Pelecanus and other birds that we met for the first time, we saw the locals fishing and others rowing or even skiing, we saw city's reflection in the water creating a magical image and we sat on benches at the edge of the lake, enjoying the tranquility that the water scenery exudes. 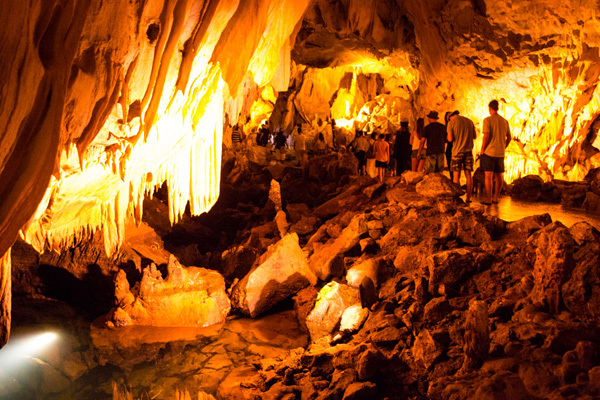 The Cave of the Dragon is about 300 meters long and 10,000 years old. 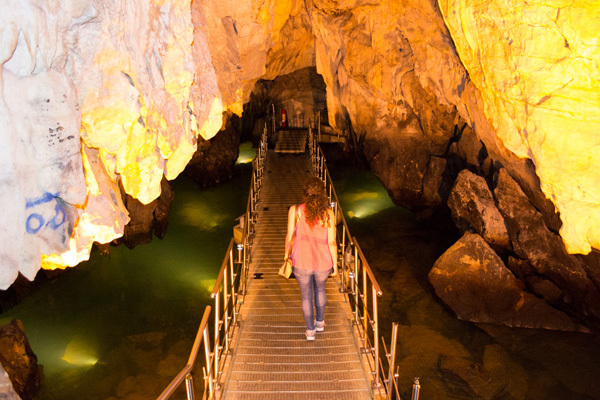 Inside the cave you will see impressive stalactites and stalagmites as well as 7 underground lakes. The cave took its name from a myth, according to which many centuries ago the cave was a gold mine and a dragon kept it. The entrance to the cave is every half hour in guided tours and the ticket costs 6 euros. The Monastery of Panagia Mavriotissa is located a few meters away from the Cave of the Dragon and dates back to the 12th century. 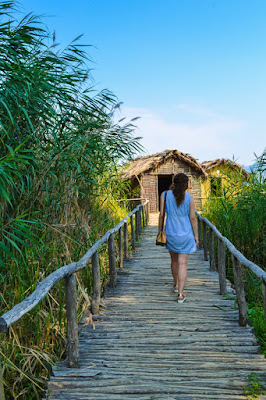 The original name of the temple was Messonisotissa as it is located right in the center of the lake and later renamed to Mavriotissa because of the opposite lakeside village of Mavrov, whose inhabitants were taking care of the monastery. 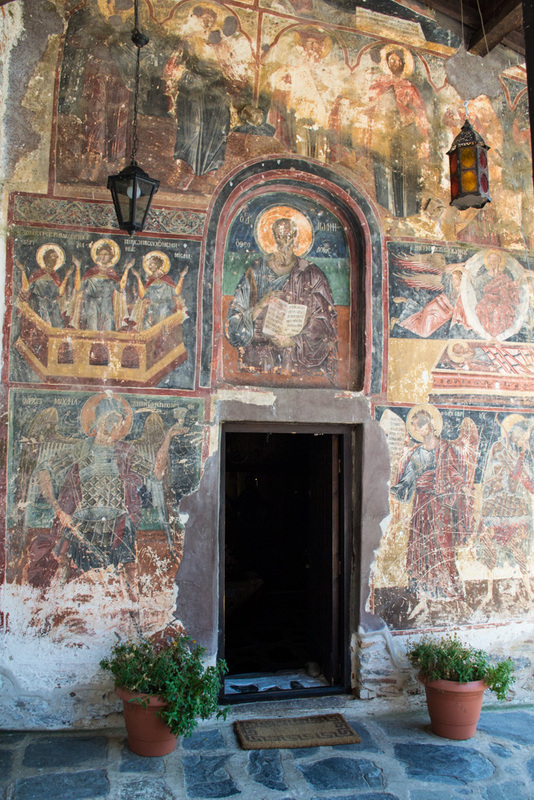 A characteristic feature of the temple is the external frescoes, which are often found in the Balkan temples. 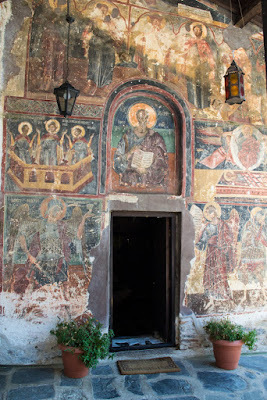 During the Ottoman occupation, the conquerors removed the eyes from all frescoes, while the temple was converted into a stable and that is why the floor is damaged. 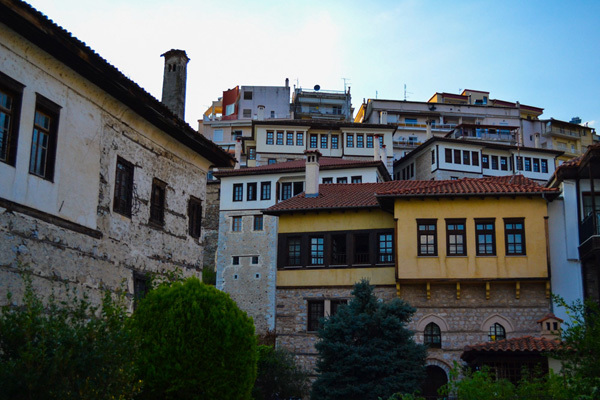 Byzantinologist Henri Grégoire once said that if the Byzantine tradition is ever lost, the city of Kastoria is enough to recover it. 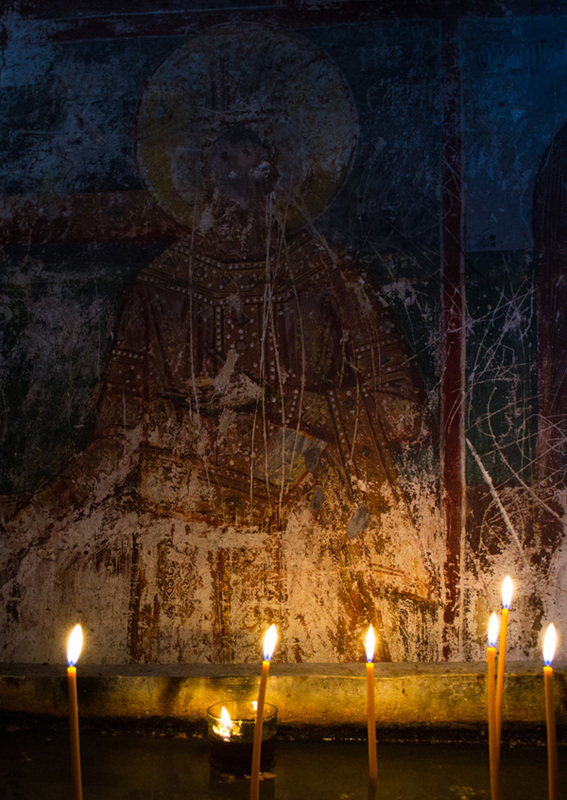 The great prosperity of the city from the 10th to the 19th century was the reason why there are 61 surviving Byzantine and post-Byzantine churches in this small town. 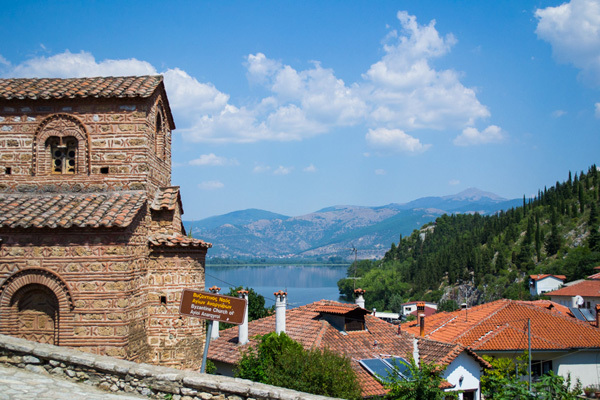 The church of Agios Stefanos is the oldest church in Kastoria that survives until today. Among the most famous temples are the Agioi Anargiri, Panagia Koumbelidiki, the Taxiarchis Metropolis and Agios Nikolaos of Kasnitzis. 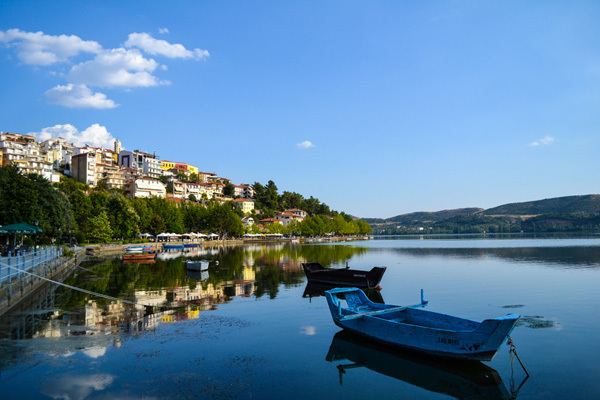 The great prosperity of the city of Kastoria over the centuries due to the fur industry is evident from the impressive mansions that stand imposingly to gaze at the lake. Most of them were built during the 17th and 18th century and are distinguished for their frescoes, stained glass and their external figurative appearance. 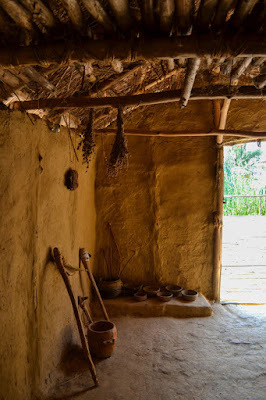 The two traditional neighborhoods of the city are the Apozari on the north side and Doltso on the south side of the city. Walk in the two districts to admire the narrow paved cobbled streets, the traditional mansions with beautiful gardens, the Byzantine temples and the various museums. 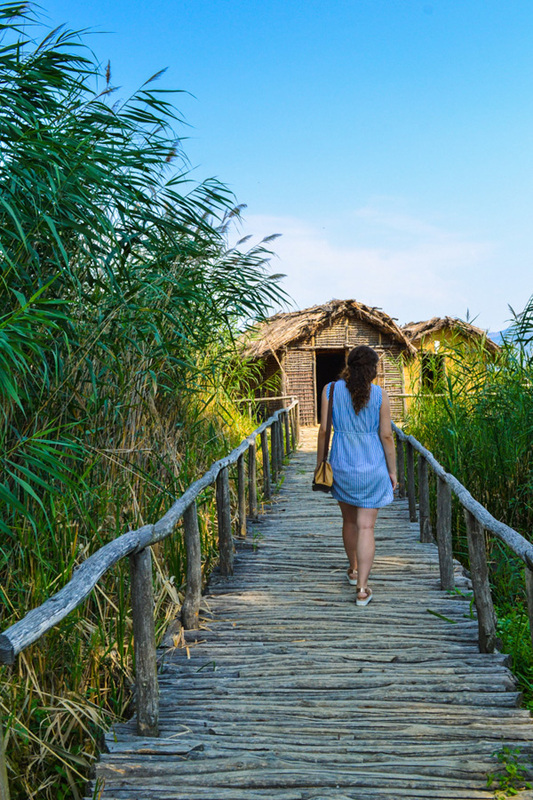 Just outside the city of Kastoria in the "Nisi" location, lies the Lakeside Neolithic Settlement of Dispilio. The settlement was found in 1932 when the lake level subsided and some remains of wooden piles were visible. When the lake level fell more in 1965, more evidence came to light of the existence of an extensive lagoon settlement of the Neolithic period. Excavations began in 1992, followed by the reconstruction of the settlement, which currently consists of 8 huts. Particular impression is given by the existence of a sign that dates back to 5260 BC and it is presumed to be an early form of writing. As you have understood so far, Kastoria is a beautiful city. So do not forget to take a break and relax by admiring the view of the city over the calm waters of Lake Orestiada. 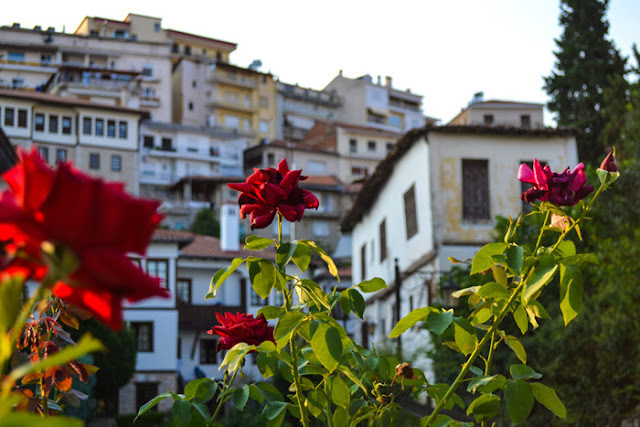 Start your day by going up to Profitis Ilias to enjoy your coffee overlooking the northern side of the city and continue a little further up to Agios Athanasios, the highest point in the city of Kastoria. At noon, go outside the city, to the village of Aposkepos which reminds of a balcony hanging over Kastoria. And if you want to combine the magnificent view with a magnificent sunset, do not miss tha chance to visit the Nautical Club. Sit on the balcony and enjoy the city being reflected in the waters of the lake as the sun goes down.. 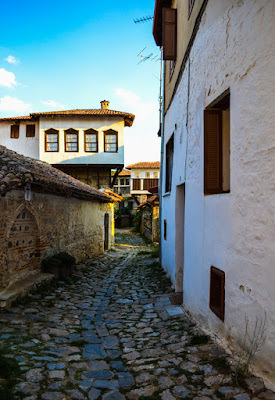 Wherever we ate the three days we stayed in Kastoria, the food was excellent. I was particularly impressed with how many and good restaurants this little city has. Even more impressive was the restaurant Grada, which is located on the northern side of the city, next to the lake. I had read about this particular restaurant as long as I did my research before the trip and I also received many messages while I was there, recommending it to me as the city's best restaurant. And it was meant to be one of the first restaurants I visited when I arrived in town. Grada is not just the best restaurant in Kastoria but one of the best I've visited in Greece. 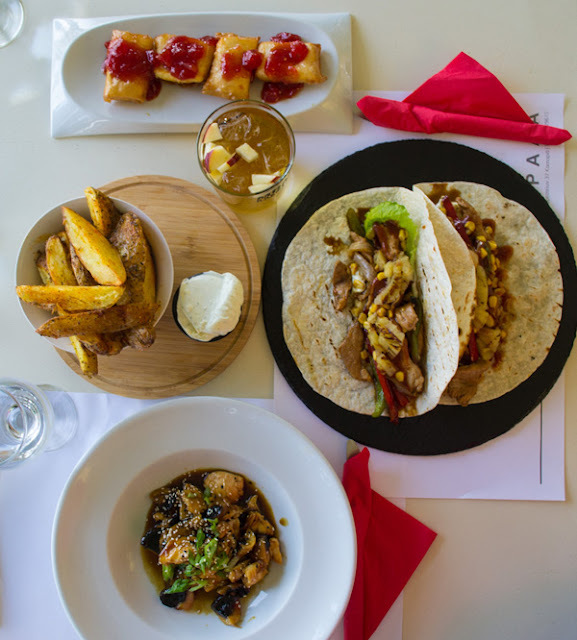 It's a gourmet restaurant, with international influences and a great outdoor and indoor space exudes a luxury combined with a sweet warmth. Try the fried cheese pie with tomato jam and fried chicken with mushrooms and honey. 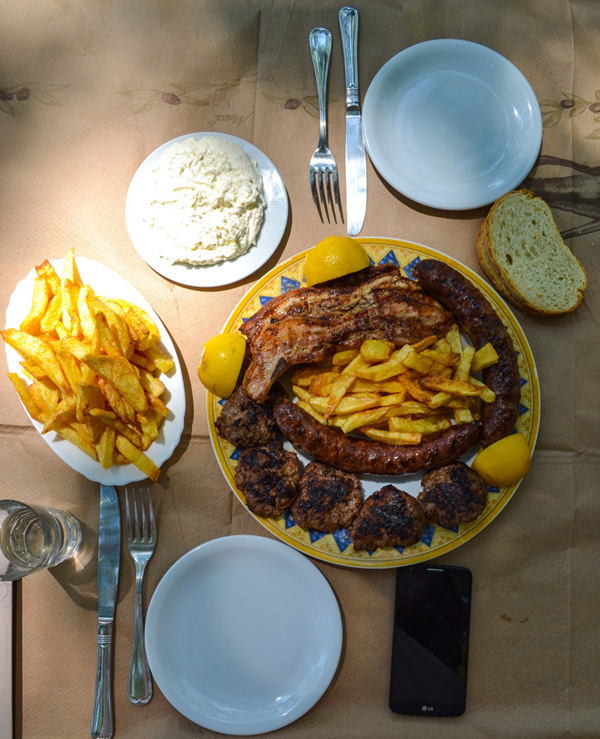 The second restaurant that fascinated me in Kastoria, was Maria's Tavern. I did not find it anywhere on the internet. Neither reviews on the tripadvisor, nor photos or anything. 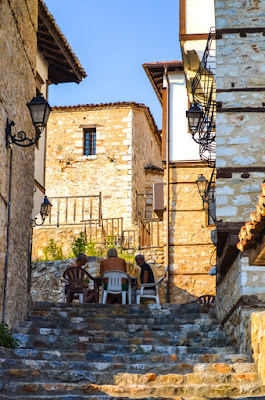 But you don't need tripadvisor when there are locals and when there are hotels such as EsperosPalace, whose people will do everything to make your stay unforgettable and recommend the best restaurants (thanks Kimon!). Just outside of Kastoria (about 10 minutes drive) in the village of Aposkepos, Maria's Tavern (formerly Platania) is a small oasis. The food is delicious, the prices are excellent and the best ... All in a quiet square, under huge plane trees, running waters and Kastoria spreading out in front of us..
After a 3-and-a-half-hour journey, we arrived quite tired at Esperos Palace Luxury & Spa Hotel, but a few seconds were enough to forget about any fatigue. The warmth and smile with which they welcomed us, the gorgeous reception with the huge spaces and the comfortable sofas, the transparent elevator with the magnificent restaurant view, the sunshine that fell from the glass ceiling creating a strange geometry in the restaurant and finally the room, with this huge and so comfortable bed (read more about my stay in Esperos Palace here). How can someone not love Kastoria when the journey starts like this?